I know you haven’t been in the Delta Quadrant. So where have you been? OK, so it’s been a while. I know. While I wish I could say that I’ve been on an Intrepid-class Federation starship named the U.S.S. Voyager, sadly that is not the case. It’s a little hard to be writing blog posts when a) you don’t know exactly what to say after having written hundreds of posts before, and b) you’re just REALLY busy. 2016 was a rough year, but 2017 has also had its challenges so far. You know that I’m always in some sort of work search mode, and that’s already had its ups and downs for the past few months. I was excited to get my first independent contract. It was an opportunity to finally flex my e-learning muscles, and do it on my terms. I started to create a curriculum matrix, to make storyboards, to write transcripts, test questions, and study guides, and created video training–21 completed videos in about a month. But the contract ended before the full project was completed, and I don’t know what will be happening going forward. There was a big learning curve involved, and after the fact, I’ve realized where I made some wrong moves, but I also learned where I made many right moves as well. I’ve been mastering TechSmith’s Camtasia during this time, and feel pretty comfortable with it now. I sometimes feel I missed out on one of my many callings as a video editor (although you never know–that might change going forward). I know that I was producing good content, if I say so myself, so I have to be satisfied with that for now. I also was the co-chair of the STC-Philadelphia Metro Chapter (STC-PMC)’s annual CONDUIT conference. Thankfully, that came off with few hitches, and it was well received by everyone I heard from. Some people hadn’t been to the conference in years, and it was a great opportunity for them to see how our conference has grown! Next year, at this point, it looks like I’ll be the main chair for the event, so it’s going to feel a little overwhelming, I’m sure. Just being co-chair felt overwhelming at times, while trying to work with client deadlines. It stressed me out enough that I even got physically sick for a while. For CONDUIT, the payoff is worth it, and I hope that everyone who is reading this considers coming as a presenter or attendee for next year. Oh, and I can’t forget that I’ve been studying my DITA by helping someone who is writing a book about it, and I was asked to contribute edits as a beginner who wanted to ensure that they understood the author’s instructions. That was cool, and helpful. Kim: Is she kidding us? Overwhelming? Paris: That’s what she claims. Who am I to argue? I spoke to veteran tech comm consultants at CONDUIT and through Single-Sourcing Solutions’ TC Conclave, as well as just talking to other technical communicators when I had the opportunity offline. All have provided me with advice about how to move forward in the future as an independent consultant, and massaged my ego just enough, knowing how battered and bruised I felt at times. For that, thanks to all of you. You know who you are. This is why I get involved with the STC and with other technical communicators. Five years of networking is finally paying off–you know me, I know you, and I can learn more about things that they don’t teach you in grad school. I benefit from your experiences and I’m grateful. Kim: I think we should take a ship-wide survey or start a betting pool on what she’ll do next. Who’s in? So now the question is…what do I do going forward? I’m in limbo once again with timing, figuring out what to do next. At this writing, I’ve decided to lay low for a couple of weeks. I’m concentrating on my VP duties for the STC-PMC for the rest of this program year (two more main events to go right now! ), reworking my consultancy’s website (a project temporarily postponed when I started my contract in February), and doing a little bit of project hunting, but nothing too deep just yet. I have a few leads on things, but I’ve always been hesitant to “count my chickens before they are hatched,” as the saying goes. I’m looking forward to attending the STC Summit in a few weeks in Washington, DC. I’m getting excited about going, because I realize that it’ll be nonstop tech comm for me almost from the moment I get there! I’ll be with my tribe! I plan to take advantage of seeing all my STC friends–and making new ones as well–in the hopes that my continued networking will help me build my business. I’m looking at things through a slightly different perspective now. In some ways, I’m still scared to death being “on my own”. Having survived through my first experience without an agency, though, was exhilarating, and I liked being my own boss and calling most of the shots, and determining how things should be done. I was able to validate that in many ways, I’m still on the right track, even if things are slow-going right now. Kim: Captain, there’s something out there! 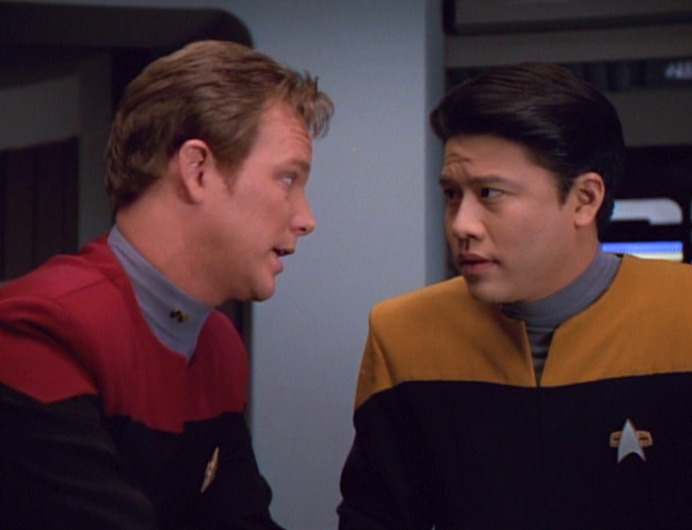 Janeway: I need a better description than that, Mr. Kim! I still have a very long way to go, but I’ll find my way eventually. 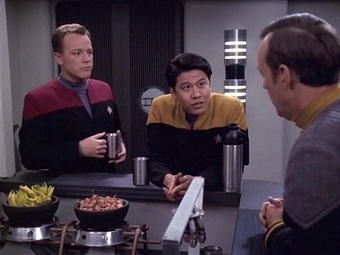 Sometimes I feel like the very green Ensign Kim, who has some knowledge, but still finding my place while trying to make a difference. 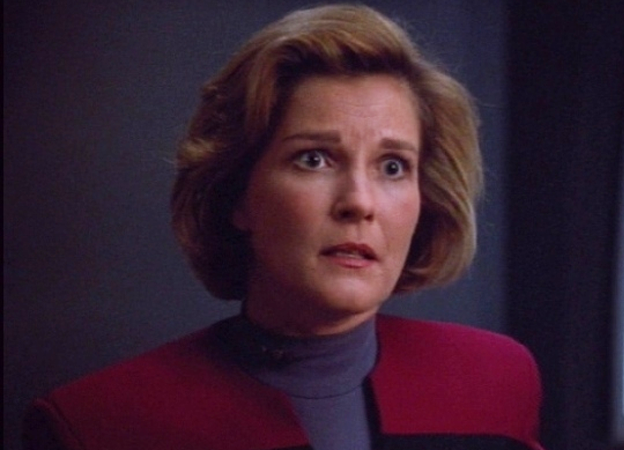 Sometimes I feel like Captain Janeway, where I feel like I can lead and figure out what needs to be done. There will be Borg, Kazon, Vidiians, and Hirogen to battle along the way, I’m sure. Hopefully my persistence moving forward will get me where I need to go, even if it takes a while. This entry was posted in Uncategorized and tagged 2017 STC Summit, Borg, Camtasia, Captain Janeway, CONDUIT, content strategy, Delta Quadrant, digital literacy, DITA, DIY education, e-learning, education, elearning, Federation, Harry Kim, independent consultant, independent consulting, independent consulting business, instructional design, Kathryn Janeway, Learning, Philadelphia, Single-Sourcing Solutions, Star Trek, STC, STC PMC, STC Summit, TC Conclave, tech comm, TechCommGeekMom, Technical communication, technical communications, TechSmith, TechSmith Camtasia, Tom Paris, Voyager, Washington DC. Bookmark the permalink.